Lots of teachers we worked with were initially very unhappy about the use of Kindles or other e-readers in the classroom. Some felt they worked hard with their pupils to develop a love of books and e-readers were, in some strange way, threatening this. It took a while to convince them that the ‘books’ still existed, independently of the medium they were stored on. We are convinced that children should learn that ‘books’ come in many forms; paper based, readers that use electronic ink (such as Kindles), on a tablet, on a smart phone, on a computer monitor. 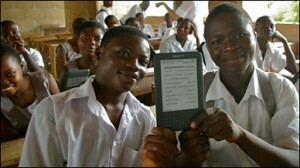 They are all ways of accessing books and can – and should – co-exist quite happily in the classroom. This is especially important for those kids who have a mass of electronic devices at home but maybe no paper based books. 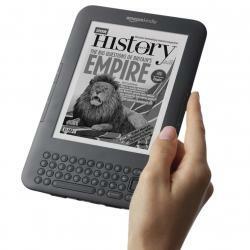 We also found that Kindles offer some additional benefits. In particular, slow or ‘reluctant’ readers quite often take to e-readers because tend to lose the meaning of the text far more easily and get bored. We found that choosing books with a speech synthesiser and allowing them to switch it on when they started losing track of the story or were getting tired renewed their interest. they can be shown how to adjust the font, the font size and the page orientation so that they can choose the combination they find easiest. Sounds interesting and …valuable for a class. Unfortunately couldn’t dream of it – not to try it! A Kindle is very expensive. I am rural teacher and the price for this device it’s a month salary of a parent. The school can’t afford to buy it, either.